The protest will continue on Tuesday, Jan 17. For directions etc see the Jan 13 entry Help Residents’ Camp & Picket-Line Hold Back Clear-Cutting Protected Area. It was frosty today, and will be colder tomorrow. Please be prepared! 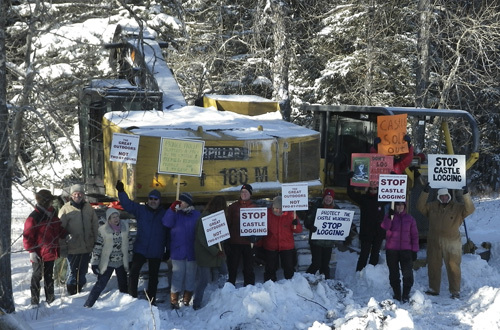 It’s been five days and counting that Spray Lake Sawmills has been unable to start any logging operations. There were a good number of folks out today to walk the picket line, including a good contingent from Calgary. Our unofficial poll of vehicles shows that the honks, waves, and “thumbs up” vastly outnumber the negative reactions. Thanks to everyone that gave us a friendly wave and smile today! We’ll be out again tomorrow, Monday, Jan 16. Please come and join us if you can. It’ll be cold. Dress twice as warmly as you think you need to. The protest is scheduled to continue on Sunday, Jan 15. Please join us if you can. Note that the weather is forecast to become very cold, and the roads are likely to be poor. Plan accordingly. Follow signs to Castle Mountain Resort, Alberta. West of Beaver Mines on #774, drive 1.7 kms past the Castle Special Management Area / Forestry entrance. On left hand side. (Coordinates 49.418126 N, 114.289171 W). Important: Please obey the speed limit through the Hamlet of Beaver Mines! Phone Peter Sherrington 403 627-3522 psherrin@telusplanet.net; or Carolyn Aspeslet at Castle Crown Wilderness Coalition office 9:30 am to 2:30 pm 403 627-5059 or evenings 403 628-3528,office@ccwc.ab.ca or Mike Judd 403 627-2949. Dress warm. Come self contained (snacks, lunch, water, etc). Please remember that there are no facilities of any kind. Outhouses are further along the road at the Syncline x-country parking lot, or store with food & washrooms in Beaver Mines. To keep the camp a peaceful, lawful and respectful site. Saving the Castle protected area & all there deserve that respect. 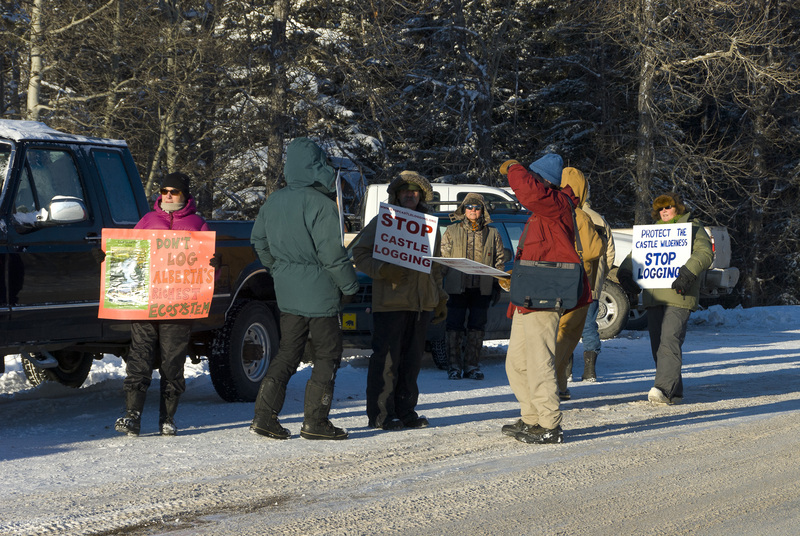 Beaver Mines: Yesterday morning, more than thirty local residents braved the cold to tell the government that they oppose clear-cut log in the Castle Special Management Area west of Pincher Creek, Alberta. The residents have a multitude of concerns, starting with logging should not be occurring in what the province designated as a Special Place protected area to “preserve Alberta’s natural heritage.” Other concerns include the damage the logging will do to this popular recreation area, outdoor recreation-based businesses, the main water source for southern Alberta, and what the province zoned as Critical Wildlife and defined as crucial for maintenance of specific fish and wildlife populations. They are frustrated that the government is ignoring its own protected area decisions and citizen’s concerns. They called on all other voters to phone and email Premier Redford and their local MLA to save their recreation area. 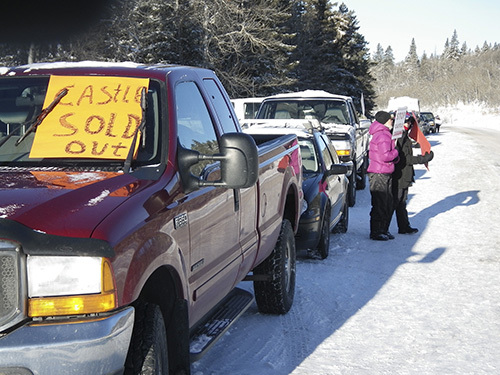 “I think it was clear yesterday morning that Spray Lake’s and SRD’s “social contract” for logging in the Castle has expired”, says Gordon Petersen, Beaver Mines Resident & President of the local Castle-Crown Wilderness Coalition. The heavy machinery is waiting on site until SLS and SRD figure out what to do with protesters that remain at the site. “Unless enough voters speak out, their favourite recreation area is going to largely wind up in wood chips and fence posts,” says Petersen. Half of the mature forest in the popular recreation core of the Castle is slated for logging over the next three winters, with some clear-cut blocks stretching upwards of two miles long. Spray Lake Sawmills plans on removing 4,737 trucks of logs; pending the low lumber market. About 40% of the volume of logs will wind up as wood chips and fence posts. In 1998 the Alberta government protected the Castle as one of 81 areas across the province under its Special Places 2000 policy. But the Castle, unlike the other 80, has yet to be legislated because SRD claimed they could use other tools to achieve the preservation and outdoor recreation goals stipulated in the Ministers’ decision. In 2001, Alberta Environment and SRD issued a public document saying they couldn’t proceed with the final step in implementing the protected area decision until the province’s Ministers (Cabinet) decided what kind of park they were going to legislate it as. “Since when does one government department, SRD, get to override a decision of Cabinet; one that was the result of years of public consultation?” asks Dianne Pachal of Sierra Club of Canada’s, Alberta Wild Program. At the general invitation of the Tourism, Recreation and Parks Minister, a local, consensus-based process of businesses, Shell Canada, ranchers, recreational groups and conservation groups solved the 2001 log-jam of what kind of legislation for the Castle; recommending in 2009 that it be legislated as a Wildland Park. 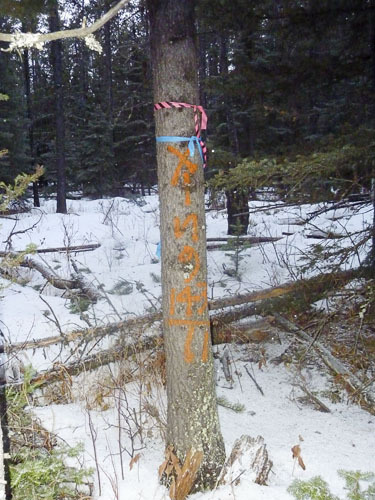 In 2010, without public consultation on the location of the logging licence, Alberta Sustainable Resource Development (SRD) gave Spray Lake Sawmills (SLS) permission to clear-cut in the core of the Castle where all the campgrounds (Beavers Mines Lake, Castle Falls, Castle River Bridge and Lynx Creek) and Scouts Canada’s Camp Impeesa are located, and on the way to the Castle Mountain Resort. They expanded the logging license last year, again without public consultation, and signed off on the company’s detailed logging plan this past fall. Recent surveys show a large majority are against the logging and for a Wildland Park, irrespective of voting preference. Seventy-seven percent of residents adjacent the Castle, and 85% of Lethbridge residents oppose clear-cut logging in the Castle, while 74% and 87% respectively want to see it as a Wildland Park. “The government is ignoring the interests and concerns of the local communities in favour of the interests of a private company not even located in the region. This is an opportunity for the new Premier to show real leadership by halting this unwanted and ill-advised logging, and then providing permanent protection for the Castle by making it a Wildland Park,” says Petersen. Petersen says that residents and business owners feel so strongly about the logging that they are vowing to continue the fight even if the first trees start to fall. SLS personnel and contractors arrived at the site to find the Cat and Feller-Buncher they’d parked the night before surrounded by people, cars, and signs. After a cordial and respectful discussion with those present, the SLS folks decided to retire for the day to consider their next move. The Press Conference went well. A number of TV networks sent crews that kept busy interviewing the protesters and filming the action. Print and Internet media were also in attendance. Protesters plan to be at the site again tomorrow (Thursday, Jan 12). 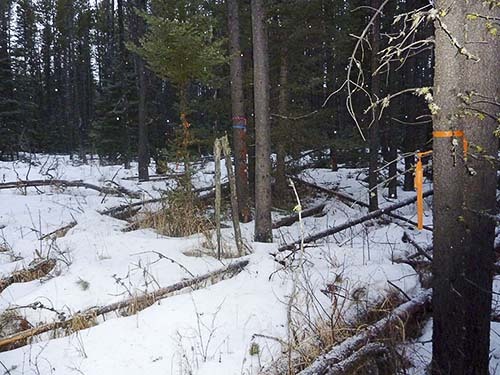 Beaver Mines, Alberta – Despite near unanimous opposition to logging in the Castle Special Management Area in southwestern Alberta, the Department of Sustainable Resource Development (SRD) continues to push through with its ill-advised clear cut logging plans. Experts on grizzly bears and watershed health have also spoken out against the logging, citing irreversible effects on ecosystem function and wildlife habitat quality. 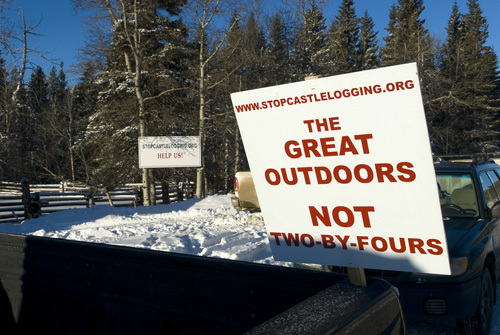 The logging will not only be detrimental to the watershed, wildlife, recreational opportunities, and area wilderness-based businesses, but will be an eyesore to everyone that drives to the Castle Mountain Ski area. You are currently browsing the Stop Castle Logging blog archives for January, 2012.